If you search for Jake Lucas using the search tool on this site you’ll get a bit of history. Part of his legacy, besides teaching so many of his friends and family his trout fishing techniques, was his patience teaching us all how to flip cast. As a trout fishing tool it’s hard to imagine not having this as part of the arsenal. I use it for 90% of my casts. The ability to drop a lure where you want it on a congested small trout stream makes all the difference. If you can master this – your success will improve. If you click on the illustration it should be full screen, use your browser back button to return to the post. Note that the cast is one fluid motion, using the wrist only – not the arm. There is a tendency, when learning this, to jerk your arm forward. Keep your upper arm glued to your side. For practice put on a practice plug and set up some targets in your yard, paper plate size, scattered about. Get used to stopping the forward motion of the lure as it goes above the target by pinching the line against the rod handle. This is fairly critical. 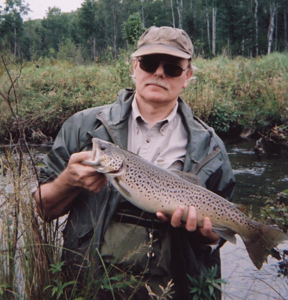 Stopping the lure right above the target, on a trout stream, translates to dropping the lure into the stream just shy of the far bank, or piece of structure. Saves lures, catches fish. The flip cast illustration shows a vintage Shakespeare closed face reel. One of the important design features is how near the reel body is mounted to the rod making the distance between the line and the rod handle minimal, in effect, making it easy to pinch the line / stop the lure. Sadly, all of the close face spinning reels on the market, the trigger spins, have the the body of the reel mounted way below the rod. It’s possible to pinch the line to stop the lure, but it is harder to do. 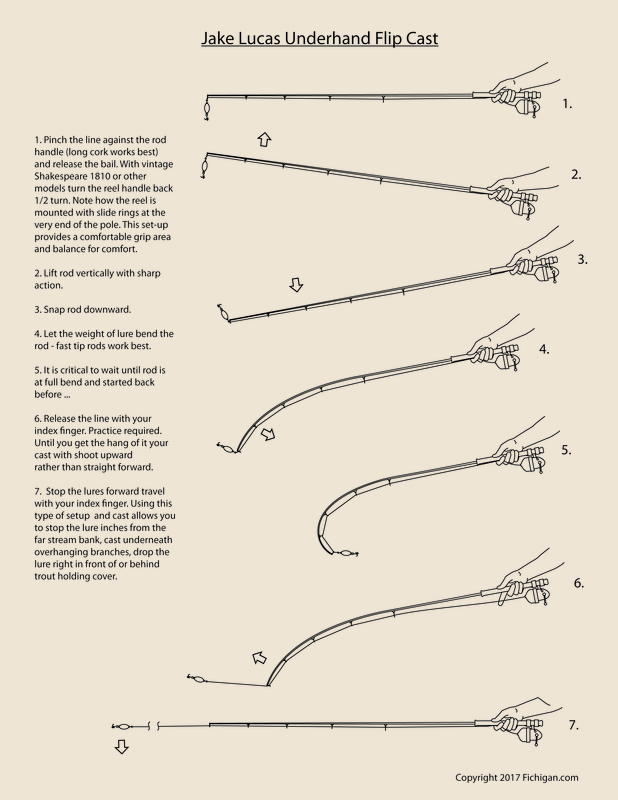 If anyone working for a reel manufacturer sees this post I hope they will pass this information along to the design department – the reel body can be moved right up next to the rod. Thousands of Shakespeare reel fans will appreciate your efforts. 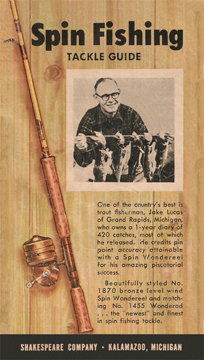 The add below shows Jake with some trout and one of several closed-face reel models made back in the fifties and sixties. Sadly, Shakespeare tried to reintroduce the model 1810 reel in the eighties or nineties, as the 1810 II. The marketing department and bean counters must have insisted the reel needed to be sold for under $30.00 because it was a shadow of it’s former self. If Shakespeare would have doubled the quality and price – they would have had a winner.